Texas Senator Ted Cruz was one of a handful of legislators who took a stand against the renewal of the National Defense Reauthorization Act this week by refusing to sign onto the legislation, which Cruz says still contains wording allowing President Obama to indefinitely detain U.S. citizens absent of due process. 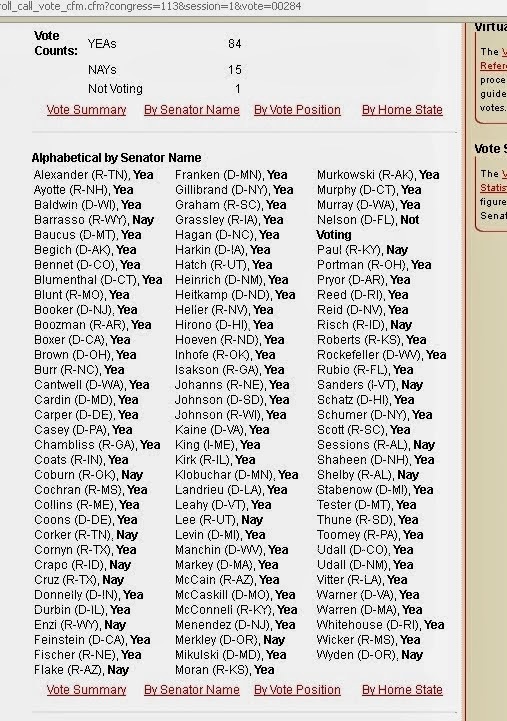 “Just voted against NDAA because it does not ensure our most basic rights as American citizens are protected,” Cruz tweeted Thursday evening. The legislation passed the Senate in an 84-15 vote late last Thursday night and “clears the Pentagon to spend $607 billion, including $527 billion in base funding and $80 billion for America’s global operations,” reports Defense News. However, the embattled senator, who earlier this year helped defeat an assault on gun rights and staged a 21-hour filibuster against the president’s namesake healthcare law, also stated in a press release that attempts to amend the bill for the betterment of due process rights were blocked. Today I voted against the National Defense Authorization Act. I am deeply concerned that Congress still has not prohibited President Obama’s ability to indefinitely detain U.S. citizens arrested on American soil without trial or due process. The Constitution does not allow President Obama, or any President, to apprehend an American citizen, arrested on U.S. soil, and detain these citizens indefinitely without a trial. When I ran for office, I promised the people of Texas I would oppose any National Defense Authorization Act that did not explicitly prohibit the indefinite detention of U.S. citizens. Although this legislation does contain several positive provisions that I support, it does not ensure our most basic rights as American citizens are protected. I hope that next year the Senate and the House can come together in a bipartisan way to recognize the importance of our constitutional rights even in the face of ongoing terrorist threats and national security challenges. I look forward to working with my colleagues on the Senate Armed Services Committee toward this common goal. The Tea Party is a misunderstood faction within the GOP. I would consider the Tea Party not just a movement, but an ideology unto itself, you could call it “Tea Party Conservativism.” Ron Paul is considered the father of the movement, in simple terms Tea Party Conservativism is conservatvism with a dash of libertarianism, or so it’s become. This movement has been hijacked by the Republicans – But this movement in the hands of non-establishment Republicans like Rand Paul is a good thing. Libertarianism is to radical for the majority of America, it is highly misunderstood. A Rand Paul or Ted Cruz can sway the Republican voters away from the Neocons like John McCain or Lindsey Graham, and show those voters they are being lied to by Neocons posing as conservatives. Make no mistake – The Republican Party is completely corrupt – As is the Democrat Party, two sides of the same coin. There is no difference between an Establishment Republican like John McCain and an Establishment Democrat like Joe Biden other then who they chose to exploit for votes. The policies they vote for, the policies they promote – are the same in the bigger picuture. They keep up appearances by voting for or against the “distraction” issues – issues such as gay marriage that are used like a frisbee for a dog to keep the entranced public busy with distractions and political theater while the illicit wars continue to be waged, the corrupt banks continue to extract wealth and water down fiat currency in what amounts to stealing, and the unemployment rate in America and around the world continues to grow. I personally am neither a conservative nor liberal, but what I see from the Tea Party is representatives going to work for those who elected them into office and doing what they were elected to do – whether you agree with their ideology or not. They have shined a light on the Neoconservatives in the Republican Party and for the first time – Many Republican voters are seeing what a neoconservative is – A war mongering, wasteful spending, elitist hypocrite with no interest in serving the public. Many of those Republican voters had never even heard the term “neoconservative” before this time, and this political awakening is a good thing. There is also ‘poser tea partiers’ like Michelle Bachman and Sarah Palin and attempts from Establishment Republicans to hijack the movement, which they in many ways have succeeded in doing. Ted Cruz has done a lot of good, including fighting for the second amendment after Sandy Hook was exploited by the gun grabbers. He stood for 21 hours in what was a quasi-filibuster, while reading Atlas Shrugged. This sort of action from Cruz gives the impression he is legit. Many claim the 21 hour filibuster was pointless, but it let all those opposed the giant mess that is obamacare know that Cruz was willing to fight against the establishment. I haven’t made an absolute verdict on Cruz as of yet mainly due to him being married to a Goldman Sachs VP, and that should be duly noted – Nonetheless I am taking the risk as of now to believe Ted Cruz’ true intentions are fighting for liberty but I will keep a close watch on him because of who he is married to. Rand Paul as well is another Tea Party conservative who seems legit – The son of Ron Paul basically says it all, although he is not quite Ron – he is far better then a scumbag Republican like John McCain who promotes nothing but war mongering. Rand like Cruz promotes the constitution and believes in fiscal conservativism. He has also shown to be consistent is his politics as has Cruz. There is much in house fighting within the Republican party, and it is refreshing. The time has come for conservatives and tea partiers to break free from the establishment neocons, who only want to waste money and bomb foreign countries just like what the democrats wanted to do in Syria. The Democrat and Republican party are the same party – The Tea Party is the only hope to severe the right wing from the neocons. Mitch McConnell, Senate Minority Leader, has recently made an interesting comment attacking actual conservatives. No – It is neocons like Mitch McConnell that give conservativism a bad name, as they are not even actual conservatives. McConnell is also being funded by anti Tea party business’ from the US Chamber Of Commerce. Karl Rove and Crossroads is also looking to eliminate the Tea Party. There is a civil war in the Republican party and the fact a scumbag like Rove would be trying to eliminate conservatives like Ted Cruz and Rand Paul should make a strong case that the Tea party is for real and not just another elitist club as long as it is not completely hijacked by the establishment and more Ted Cruz and Rand Paul like figures become apart of it. Hated by the Republicans and the Democrats – accusations of ‘legislative arson’ during the partial government shut down from the likes of Nancy Pelosi, the claims of “anarchism” from Reid, and Peter King referring to Ted Cruz as a fraud. Any Libertarian would find such accusations against the Tea party to be quite humorous for obvious reasons. Anytime someone like Peter King refers to you as a fraud; Anytime someone like Harry Reid refers to you as an anarchist; Anytime Nancy Pelosi refers to you as a ‘legislative arsonist’ -It is a good thing.